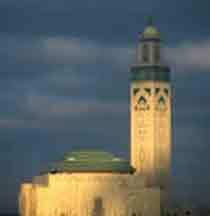 After your arrival to Casablanca, you will be escorted to your luxury hotel in Casablanca. Begin your day with a visit to the newly opened Jewish Museum in Casablanca. Although its collection is still quite formative, this is the first Jewish Museum in an Arab country. Visit the neighborhood that is home to most of Moroccoís Jewish Community. Stop by the cultural center and the Bet El synagogue. You may wish to have lunch at one of the small kosher restaurants in this part town. Dinner and overnight at your luxury hotel in Casablanca. Then as we travel past centuries-old olive groves andvineyards we near Meknes, the Ismalian capital, famousfor its 25-mile-long walls - and, not to mention excellent wine - where we'll stop for a sumptuous lunch in a grand palace. Heading to port Bab El Mansour and Bab El Khamis, journey back thousands of years and explore the ancient Roman ruins of Volubilis sprawled over a wildflower-dotted hillside, where a magnificent triumphal arch presides over the awesome remains of palaces and mansions, Roman baths and basilicas, and stunning mosaics. Sumptuous dinner and lodging at a four-star riad or hotel in Fez. Best surviving example of an ancient city, the spiritual and intellectual capital of Islam resting alongside ancient Jewish quarters. The Vibrant Jewish heritage in the Mellah, where artisan craft, antique Jewish goods and handcrafted jewelry is sold. Visit the recently restored Ibn Danan synagogue ñ the oldest extant synagogue in Fez. Until very recently abandoned and decaying, its restoration was part of a comprehensive UNESCO project to preserve the monuments and fabric of medieval Fez. Dinner at la Maison Bleu. 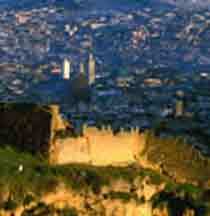 Accommodation at your luxury riad or hotel in Fez. Travel to Ifrane, a pleasant mountain city oddly out of place with its wooden chalets and steep-pitched roofs that stud this skiing village, evoking a Swiss resort. An area long popular with Moroccans on holiday, five tranquil lakes rest near dense holm oak and cedar forests, where raptors, acrobatic booted eagles, and Egyptian vultures fly overhead. We’ll pass through Azrou, a famous Berber village and then stop for lunch in Beni Mellal before we continue traveling through the picturesque countryside to Ourika Vally at the high atlas mountains. Dinner and overnight at your luxury Kasbah Omar. Valley of Ourika rises gently up to the preliminary hills of the High Atlas where small typical villages have nested. It is a pure and magnificent place where silence is only " disturbed " by birds singing, water streams and wagtails. Ourika is famous for its pottery, minerals and crystal. A visit the Jewish shrine at souk Lakhhmess at the high atlas. A couple of hours trekking to visit one of the hidden water falls of the high Atlas. Dinner and overnight at your luxury Berber Riad Omar at the village of Anrar. In Marrakech, you’ll spend a full day exploring this majestic Imperial City. 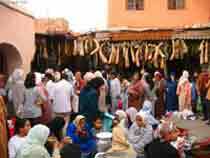 Thrill in the bewitchery of the night that beats in the heart of the famed square, Djemaa el-Fna, where delectable fare is grilled over coals in bustling torch-lit open-air markets. Mystical snake charmers, hustlers and mischievous monkeys are part of the nightly drama that unfolds, as Berber acrobats, fortune tellers, musicians and engaging storytellers seduce rapt crowds.Then wind your way through the serpentine labyrinth of the spice-filled air of the bustling souk, unchanged for over 1000 years, where you’ll discover the best of traditional Moroccan craftsmanship. Dinner at Palais Stylia restaurant from the 15th century. Accommodation at your luxury four stars hotel in Marrakech. The 60’s music legends Jimmy Hendrix and the Rolling Stones were drawn to Essaouira’s idyllic charm, which continues today to lure musicians and artists alike to the sparkling whitewashed fishing village trimmed with the brilliant azure of its skies. A former Portuguese settlement in the 18th century, its stone ramparts overlook an emerald sea where dolphins sometimes frolic near the fringe of silvery beach, and camels ferry passengers across fine sand. Dream on the beach, stroll through serene squares, browse artisan shops or the fish market, bursting with a plethora of fruit of the sea to be grilled to a succulent finish before your eyes. Top it your repast with the national drink of Moroccan mint tea and savor delectable French pastries at one Essaouira’s many charming cafes. A full day will be spent at Essaouira.......and do not forget to take your horse riding or camel ride at the beach before return to Marrakech. You’ll cap off your journey at a spectacular dinner event, the Fantasia at the desert of Marrakech, where You’ll bear witness to a splendid drama of Arabian Nights filled with belly dancing, folkloric troupes, and stately Arabian steeds charging in dynastic battles as of yore…….. and that would be your final desert for your vacation. Transfer to Marrakech airport for your return home with plenty of tales of Arabian days and nights. - Private guided tour---Not a group tour. - If it is over your budget-----Hotels can be changed for lower budgets. - Upgrade to 5* or 5* deluxe accommodation is available.